FORT COLLINS — Despite a robust economy in Northern Colorado, local developers are facing strong headwinds that are making it more costly to complete commercial and residential projects. 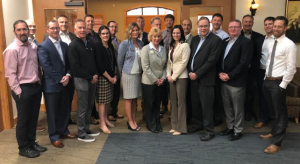 Those costs come in a number of forms — from labor to regulations to materials to water — real estate and construction industry leaders said during BizWest’s CEO Roundtable held Tuesday in Fort Collins. Providing developments with access to water is a huge driver of costs — and one that homebuyers may not always consider. Participants in the Northern Colorado Real Estate and Construction CEO Roundtable held April 9, 2019, were: (From left) David Shigekane, CEO, Neenan; Ryan Schaefer, CEO, NAI Affinity; Aaron Eide, Vice President, Flood and Peterson; Troy McWhinney, CIO, McWhinney; Stu MacMillan, CEO, MacMillan Development; Brandon Wells, President, The Group Inc.; Connie Dohn, CFO, Dohn Construction; Josh Billiard, PlanteMoran, Partner; Sabrina Nowling, Vice President of Business Development, Elevations Credit Union;Steve Kawulok, Managing Director, SVN/Denver Commercial LLC, Julia Crawmer, Broker, Mountain-N-Plains Inc.; Will Welch, CEO, Wm. T. Welch Co. LLC; Landon Hoover, CEO, Hartford Homes; Kristin Turner, Audit Senior Manager, Plante Moran; Bryan Watkins, Elevations Credit Union, Northern Colorado Market President; Mark Bradley, Owner, Realtec Greeley; Josh Guernsey, CEO, Waypoint Real Estate; Dennis Schick, Broker/Partner, Re/Max Alliance; Tom Livingston, CEO, Livingston Real Estate; Pete Kelly, Advisory & Transaction Services, CBRE; Brandon Myers, CEO, WestMark Homes. NAI Affinity CEO Ryan Schaefer said water costs can vary wildly from area to area and are especially high in parts of Northern Colorado where historically there hasn’t been a huge investment in water infrastructure. Because of those high startup costs, some parts of the region “are no-fly zones” for certain types of development, he said. Landon Hoover, CEO of Hartford Homes, said the cost to provide water access for residential projects can prove much more expensive than the cost of raw land. “That can just blow up projects,” he said. Bringing in major industrial water users is a big opportunity cost relative to economic development for Northern Colorado communities without access to the Poudre or Platte rivers, Livingston Real Estate & Development CEO Tom Livingston said. “The growth has always flowed with the river, and it will keep flowing with the river,” he said. Contractors — particularly less-than-reliable contractors — can also cause expenses to balloon for developers. Neenan Co. CEO David Shigekane said construction administration is becoming a bigger and bigger piece of the price to complete a project. “It’s a deep, tangled, messy issue,” he said. Lack of reliable labor is causing projects to take longer to complete and, of course, time is money, Connie Dohn, chief financial officer of Dohn Construction, said. She pointed to an instance when a subcontractor brought a large crew of workers to Colorado from Texas only to abandon the project before it was finished. One of the consequences of higher costs is reduced affordability for buyers and renters. “Our wage growth is not keeping up with housing costs, and that’s becoming a huge issue,” Dohn said. But without easy access to labor, the cost of construction goes up, and the affordability problem is exacerbated. Educational institutions are finally starting to recognize the need for skilled labor, Wm. T. Welch Co. LLC CEO Will Welch said. “For years, educators would never talk about construction as a viable option” for students entering the workforce, he said. Another concern from the development community is the slowdown of in-migration to the area, which is coupled with worries about the availability of employment opportunities. There is a “much more diverse workforce and a lower cost of living” in other areas of the country, The Group Inc. president Brandon Wells said. People who choose to move here often do so because of the quality of life rather than affordability. Failure to bring in more people and more high-paying jobs — both in white-collar jobs and in skilled trade positions — impacts both residential and commercial developers. On the residential side, developers and brokers need customers with buying power strong enough to afford more-expensive homes. Because of the increased cost to build homes, there are few options for buyers looking to buy homes for around $400,000. “We have a lot of builders who love to build $1 million-plus homes, but there aren’t many buyers,” Re/Max Alliance partner Dennis Schick said. In an effort to cater to middle-tier homebuyers, builders are taking creative steps such as designing floor plans without certain amenities such as basements and increasing the density of neighborhoods. In the multi-family rental market, “vacancies are very low, but expenses are increasing — especially taxes,” Mountain-n-Plains Inc. broker Julia Crawmer said. Commercial developers need a growing employment base of white-collar workers in order to boost office rents or build new office spaces. Without more employees to work inside the offices, demand shrivels. Because of the availability of existing spaces, companies looking for additional office space would “be foolish to build a new office building unless you can’t find what you need,” McWhinney chief investment officer Troy McWhinney said. It only makes sense to build new office space if a tenant needs something very specialized. A similar concept applies to retail and commercial areas, particularly in dense and already developed urban districts, according to Waypoint Real Estate principal Josh Guernsey. “Adaptive reuse” is often a more cost-effective alternative to building new construction, he said. Regulatory issues — from the cost of pulling a building permit to the potential for new laws to slow down the energy industry — remain a stitch in a developer’s side. Citing political headwinds, SVN/Denver Commercial LLC market manager Steve Kawulok said existing industrial sites in the area, which have seen very high occupancy rates in recent years, are starting to come back on the market. “Some tertiary players in the energy industry might be getting worried,” he said. Realtec Greeley owner Mark Bradley concurred, saying some industrial, agricultural and energy firms have begun moving to places such as Texas and Wyoming. Despite the challenges faced by Northern Colorado developers and real estate professionals, many say there is reason to remain optimistic. “We’re still pretty darn healthy unless we see some major shift in our economy,” Wells said. Demand for new homes remains strong, as does the number of new residential developments breaking ground every month, Schick said.